Here is my pre-sales page, but please bear with me because I’m not very good at hype and I haven’t ever done a pre-sales campaign before. Can I just be matter-of-fact about it instead, please? I put together an amazing team to work on a book I wanted to create about selling snake oil online. Too many newbies seem to get caught in all these traps which are carefully crafted for them to fall into, so it just seemed as though the time was right to create a book to describe the make money online (MMO) industry, and help people to avoid the traps. I really hope it helps you in your online ventures. Our book will be free for the first three days after publication, so be sure to grab it then. I’ll let you know one way or t’other when it’s free ’cos I haven’t even got a list for you to sign up to yet, so it’s not any kind of trap to enable me to send you billions of emails trying to sell you stuff. Am I doing you a big favour by giving it away free at first? No. It’s not a free gift because I’m a kind person. Actually, I’m a grumpy old git. And it’s not because I want to say “thank you” to my blog readers. (What a scummy way to present something.) Giving your book away free is a marketing tactic to help the book rank higher in the Amazon search engine. You’ll be doing me a favour if you download it. Even better if you like the book and write a review about it. (Pretty please.) Some people, such as Smashwords, give their books away free always. That’s because they’re using their books to promote their service. Other people give their books away for a few days to improve their ranking in the Amazon search engine. Whatever, this is supposed to be a sales page about why you should “buy” my book while it’s free. 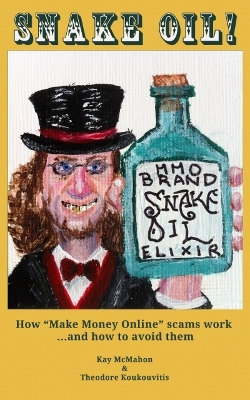 The book is about MMO scams and how to avoid them. It’s the result of a team effort. It covers all sorts of topics including how to spot an MMO scam, common traits of MMO scams, and also quite a few myth busters – website flipping ain’t as easy as it’s often made out to be. Kay McMahon – mostly I just sit around with my feet on the desk telling other people what to do. I suppose you could call me the Project Manager and Editor. Theodore Koukouvitis – he’s the guy who did most of the work of writing the book. He likes to work hard and fast so he’s pretty useful to have around. Dave McMahon – he gets to do all the tidying up, implementing, formatting and all the boring stuff that we creative types don’t like to do. OK, so what’s this book about? It’s a guide to MMO scams, how the industry works, and what you should be aware of before you part with your cash for any product that promises to make you rich. It spells out the scams, the common traits of MMO products, and more. We’re not even trying to sell you anything in the book. There are no affiliate links, no upsales, nothing to pay for at all. No requirement to sign up to any list. Heck, you don’t even have to pay for the book if you get it in its freebie few days. How will you know when it’s available? Well, it’s been said of me that I don’t need a microphone. If you’re interested in getting this book, and you’ve made it this far, you’ll know. Trust me.